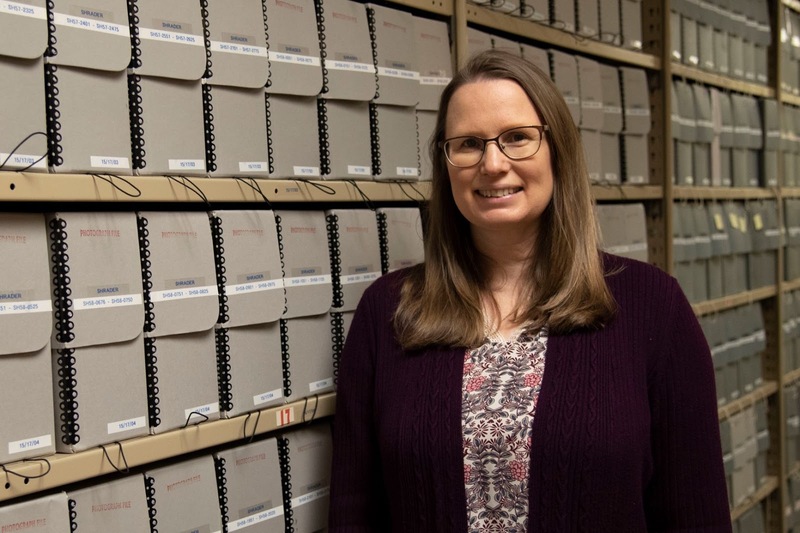 Julienne Crawford, our curator and collections services coordinator, took a moment from her busy day to talk with us about her love of history and her role in preserving and spotlighting Arkansas history at the State Archives. A: I am the curator and also serve as the collections services coordinator. I was hired as the curator 17 years ago in 2002. I first began working for the agency in 2001 as part a large digitization project that added over 12,500 photographs to our online catalog. A: I coordinate the preservation and processing of various types of collections at the State Archives. I work with staff members, including archivists, the librarian, the microfilm section, the conservator and archival assistants, to develop plans for processing and preserving collections and making them accessible to the public. I meet with potential donors and state agencies about transferring historic material. I also research, write, design and create our onsite and traveling exhibits, and I catalog our three-dimensional objects. I work with other agencies to produce offsite exhibits and other special projects. A: In high school and college in Virginia, I loved learning about the history and culture of the Upland South that is shared with many people in the Ozarks. After college, I worked as archeologist throughout the southeast U.S., including Arkansas. I then worked as the program coordinator for the Southern Cultural Heritage Foundation in Vicksburg, where I expanded my interest in the history and culture of the Delta and other parts of the South. 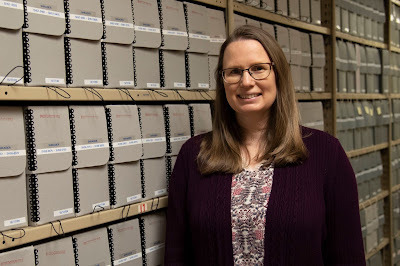 After my husband got a job in Little Rock, I started the University of Arkansas at Little Rock’s Public History program and began working at ASA on a digitization project. I was amazed by the immense collections of the ASA. In graduate school, I worked for the Clinton Library, the Central High School National Historic Site and UA Little Rock. Nothing could compare to the collections at the ASA. I was thrilled when I was hired as the curator in 2002, so I could bring the collections of the ASA to the public through the research room, as well as through onsite, offsite and traveling exhibits, publications, programs, educational resources and digitized collections. A: One of my favorite items at the ASA is a letter from Edward Payson Washburn to his sister as a teenager in 1846. My favorite painting in our collection is a self-portrait of Edward Payson Washburn, the artist who painted the original Arkansas Traveler. The letter shows the wit of the young artist as he joked with his sister about sending the letter by telegram, going off to war, and writing the letter in the latest fashion from Paris. He doodled a drawing of clock and a soldier in the Mexican War on the page and told his sister about visitors and life in their house. Letters like these give us a more personal glimpse of the past, not just the facts of a textbook. A: The Arkansas State Archives has the largest collection of Arkansas archival material in the world. Arkansans can explore the history of their communities and families through newspapers, photographs, correspondence, government records, organizational papers, business papers, music, artifacts and other resources. They can learn about what was life was like for their ancestors and examine important parts of Arkansas history through various primary sources. The Arkansas State Archives has the important responsibility of preserving the history of Arkansas and its people for future generations. A: The most rewarding part of my job is bringing the amazing collections of the ASA to the public. Through traveling exhibits, publications and online collections, I have been able to bring the collections of ASA to communities throughout the state. I also enjoy helping people find the hidden treasures in our collections that answer questions about their families and research interests. Q: How do you see archives evolving in the future? A: I see the continued expansion of online resources as important for archives. We are currently working on plans to make more of our collections searchable and viewable online. Finding the best way to preserve and access electronic records in quickly changing computer formats is an increasingly important part of modern archives. We are continuing to expand our electronic records program and develop protocols to preserve those records and be able to access them in the future. Archives are also evolving to bring their collections to the public in a variety of ways. The ASA continues to expand our outreach through the development of new programs, symposiums, educational resources and exhibits. A: I wish more people knew how amazing the collections at the Arkansas State Archives are. The ASA has something for almost everyone's interest – one can search old newspapers from communities throughout Arkansas, listen to the immense collection of music transferred from the Ozark Folk Center to the ASA, view images of people and places from the collection of over half a million photographs, and research various archival collections and government records.